join forces in combining both technologies in an integrated platform. LikeAbird is a R&D Think Tank company providing innovative systems, products and solutions in the field of the unmanned (air/land/sea) and robotic industry. Abstract: Smart systems are a hot topic these days. Enabled by continuously shrinking electronics, we can now add software to almost anything, from thermostats to autonomously driving cars and self-regulating energy networks. But is a smart system also trustworthy? Will it ever be smart enough to be trustworthy? 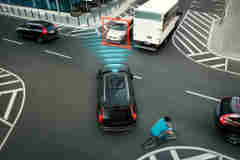 Self driving cars for example use artificial intelligence to mimic the behaviour of an experienced driver. Clearly, this is a hypothetical driver as human drivers make mistakes all the time. And how would you feel when your car updates its driving software while driving? How smart is a self-driving software that keeps on speeding after it detected six times in a row that the driver was not paying attention to its warnings? How smart is it to have a dishwasher talk to the internet so that it doesn't work when you have no connection? Of course, this type of smartness was introduced by smart people. The issue is complexity, made worse by legacy developed at a time when trustworthiness was a second thought. In the real world the complexity is immense and the law of Murphy is king. The question is how can we make things simultaneously smart and trustworthy? Another question is whether such a smart system should mimic a human brain? Trustworthy means predictable, safe and secure; all aspects for which humans have a very bad reputation. The road to salvation is a systematic one whereby unavoidable errors and faults are taking into account at every step of the development. Fault tolerance and resilience are key. Download the presentation in attachment. How do companies tackle technological challenges? During this Seminar Day, engineers, researchers and R&D managers from the manufacturing industry will come together to learn more about the results of some of our recent projects. More specifically, Altreonic will show how POF reliability prediction and analysis at system level is applied by Altreonic for developing the KURT e-mobility vehicle. The process covers from selection of components and sub-system modules as well as the software architecture. Altreonic has now ported the latest VirtuosoNext Designer to ARM Cortex M-series microcontrollers. The latest version fully exploits the Memory Protection support to provide fine-grain partitioning and allows fine-grain recovery from processor exceptions in a few microseconds at the Task level. This effectively provides fault tolerance for the applications without the system experiencing any significant delay and without having to apply costly hardware redundancy schemes. At the system level, the resilience level is greatly increased at virtually no cost. The economic advantages are significant. Now that we have support for fault recovery in VirtuosoNext, we have been wondering how extensive the coverage could be in real-life systems. The issue is that data on failure root causes is either considered as confidential, either narrowly focusing on specific elements (e.g. hardware reliability). We cannot really find statistical data for these system level failures. Do you know of any such data? The webpage with a discussion forum is here with the videos here. Altreonic is recruiting embedded software engineers. Candidates need to have a good understanding of low level programming (C and assembler), rigorous testing and preferably qualification requirements. Forward your motivated interest and resumé to Annie Dejonghe: a.dejonghe (@) altreonic.com. If selected as a candidate, be prepared for an intellectually challenging test.